Since early Wednesday morning, a huge effort has been ongoing to clear the shoreline in front of the operators at Sorobon from the Sargassum that has flooded in in huge quantities. STINAPA is coordinating the event by directing volunteers and big equipment to strategic places. The aim is to open channels in the sargassum mats in order to create more flow so the seagrass and marine life have a better chance of survival. Most of the volunteers are working in the shallow waters raking the seaweed to shore where the loaders can remove it. 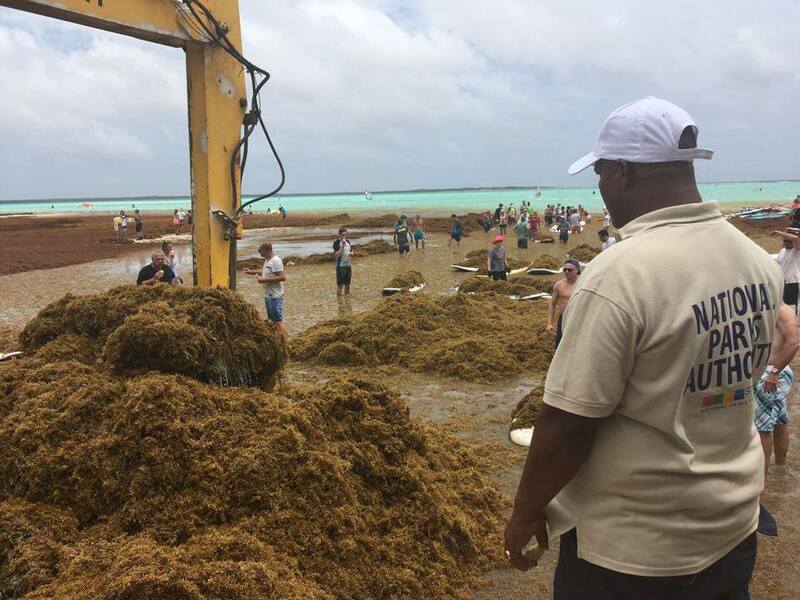 The magnitude of this sargassum incident is so large and the capacity for Bonaire volunteers and current organizations involved in the clean up is too limited. We need more people! Due to the lack of capacity we have to concentrate our efforts on one area, which for now is Sorobon due to the number of people that are here already and willing to help. Progress is slow and at least 1 or 2 more days are needed to target this area alone. Other area’s such as Lagun also need to be cleared so as soon as there is more capacity we will divide our efforts to include other impacted area’s. All day today and all day tomorrow, STINAPA, OLB and volunteers will continue to clean up at Sorobon. We need more help so please show up at Sorobon with watershoes/booties, gloves and a bucket or container (if you have it) for collecting the marine creatures. Equipment such as rakes, gloves, shovels, snacks and drinks are available for all volunteers, just find the STINAPA volunteer check point on the side of the road. People with shovels rakes and wheelbarrows are very welcome to help get rid of the seaweed in the water and along the coast..
We are very grateful for the support of the Liuetenant Governor and the staff of the Public Entity (OLB), the fire department and especially thankfull for all the hard work the volunteers and staff of all supporting organizations are putting in here at Sorobon today!